Ready for the easiest recipe of your life? This is a family favorite around here. My husband is vegan so a lot of times I try to adapt regular recipes or vegetarian recipes to suit a vegan diet. This recipe is one of our favorites because you can skip the meat and you don’t even notice it’s missing! 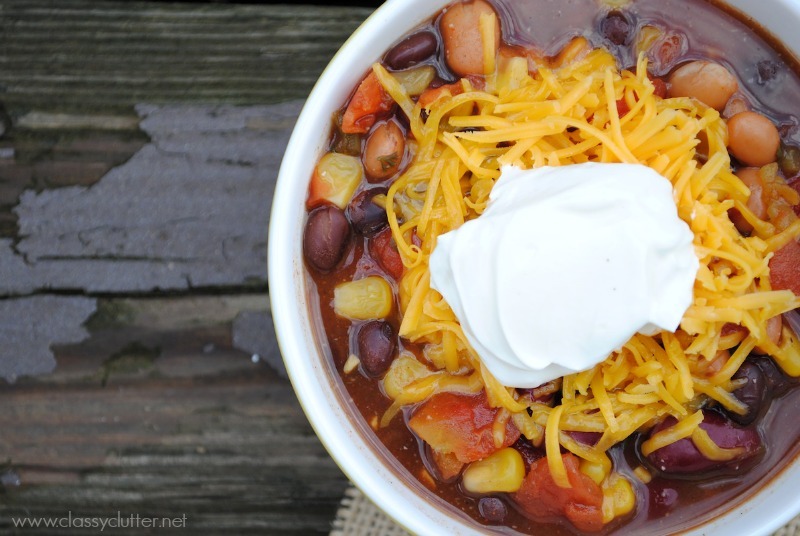 There are a million taco soup recipes out there and I’ve been making it for years but I HAD to share our Slow Cooker Vegetarian Taco Soup Recipe with you! It is SO yummy and ridiculously easy. 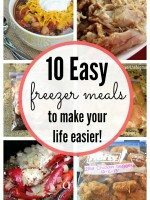 It also makes amazing leftovers and an incredible freezer meal. Win, win, win! 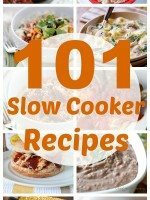 Place all ingredients in a slow cooker for 8 hours on low or 4 hours on high. Top with your favorite toppings like cheese, sour cream, fresh cilantro and tortilla chips! This recipe is SO easy, my 5 year old can do it. 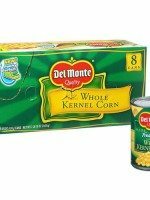 The kids love to help as I open the cans, they pour them into the slow cooker and that’s it! So quick and easy! Told you, how easy was that!?! It tastes SO good and there is NO cooking prep. This also makes the BEST freezer meal. I suggest placing leftovers in a freezer bag and freezing it flat. 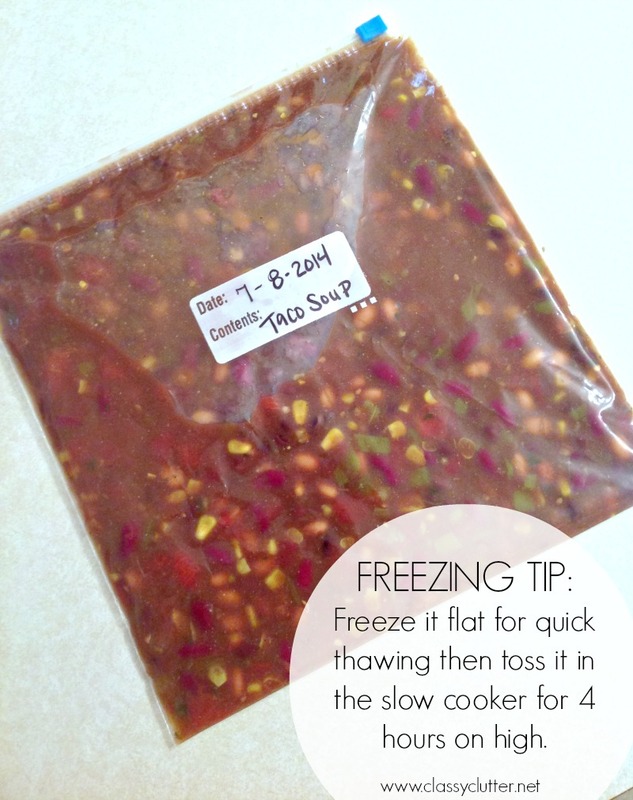 To reheat, run hot water in the sink and place the freezer bag under it until it begins to thaw. 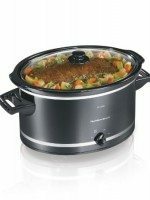 When it starts to break down, pour your frozen soup into the slow cooker and heat on low for 8 hours, high for 4 hours or until the soup is hot throughout. SO easy and awesome! I love having this on hand because dinner is basically made for me! This is perfect for the cooler temps that will be creeping up on us this Fall! Enjoy! The picture itself makes me crave for it. Really mouthwatering. I am going to try it tonight and share the results. So you don’t have to drain any of the cans? Nope! You can if you like it less soupy and more like a chili but we don’t drain them! Thanks for stopping by! 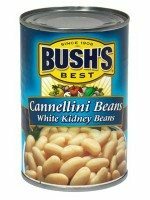 I drained the juice out of the cans of beans and corna (not the tomatoes and chilies) and used V8 juice to make it more soupy. I made this to be compliant with the Daniel Fast and served with corn tortilla chips. It was absolutely fabulous. I had men asking for the recipe!!!! This turned out great. 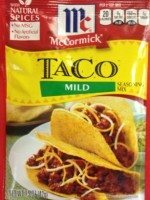 I added veggie crumbles to make it more like a taco (tacos usually have H.B. meat). It is a little on the spicy side, but tastes wonderful. Also was surprised how much it made. I would say 8-10 servings. Did you cook the veggie crumbles first? Or just put them in frozen? Thanks! I made this and my family loved it! Even the carnivores in the house didn’t miss the meat! Delicious and easy….definitely one I will make again and again! Do you think i could cook this on the stove? what would the time be ? 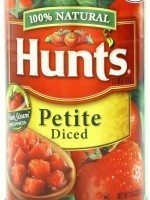 I’d love to know what size cans of at least the diced tomatoes. Thanks! Looks great! 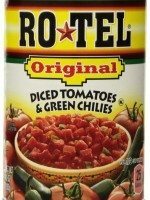 What size cans of diced tomatoes, corn, and Rotel? 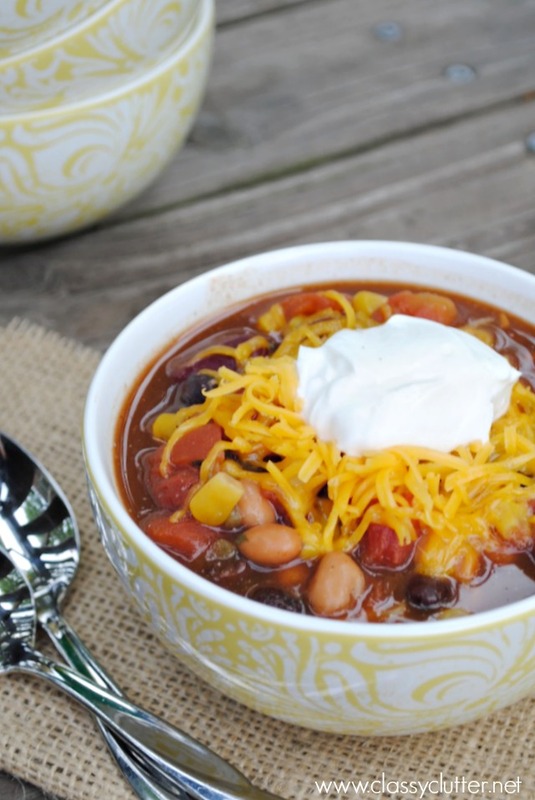 The ABSOLUTE BEST TACO SOUP RECIPE BY FAR!!!! I LOVED IT AND SO DID MY SON!!! He is begging for more! Thanks for sharing! 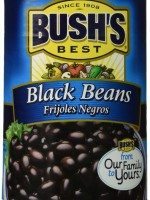 This is my family’s new favorite soup. 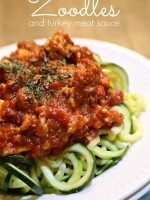 Thanks for a great healthy recipe! I love this soup. Thanks for sharing the recipe. I added veggie crumbles to make it more like a taco (tacos usually have H.B. meat). It is a little on the spicy side, but tastes wonderful. It’s so delicious. Just told my about this. She will be making it for me. Thank you for such an awesome recipe. 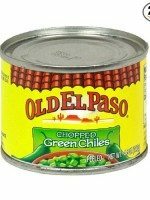 Really unique Recipe and I never know such information about the Taco Soup Recipe. Thanks For Sharing such a nice post. Hello, Mallory & Savannah Mam! 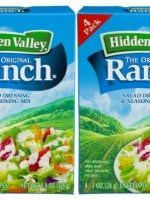 Can I make this without the ranch seasoning or will It not taste good? Wish I could include the source but can no longer find it :(. I also added beyond meat ground beef and topped the soup with tortilla chips and daiya cheddar shreds. It turned out delicious!!! Even my 13 year who hates the vegan thing loved it!!! Hello Mam, I love this Vegetarian Taco Soup, but i been lacking to prepare as this show here, How much time it require to kept in cooker to get ready. Yummy, i love taco soups. Mouth watering images,look like very attractive .i think this soup will improve our health.Please give more information about soup preparation. I am not a big fan of soup but this pictures changed my attitude.Please post more pictures. Mouth watering pictures.Please post more article about soup. Friend Don’t forget to share again more mouth watering pictures. I’m going to drain and rinse the beans and corn but not the tomatoes. Should I add some vegetable stock to make up for the liquid? I love this Vegetarian Taco Soup, but i been lacking to prepare as this show here, How much time it require to kept in cooker to get ready. 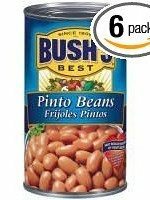 I don’t use the can beans.. is it okay to prepare this with dry beans? By far the best vegetarian taco soup ever! I’ve taken this to work potlucks several times and everyone loves it!! It’s great anytime of year but even better on those cold evenings in the fall/winter here in Texas! Thanks for a wonderful recipe!